The kingdom of Lax Xang (Million Elephants) is not far from Vietnam as many suppose. To travel between Vietnam and Laos through borders, there are 6 choices for tourists, including Tay Trang( Vietnam)/ Sop Hun (Laos), Nam Xoi/ Na Maew, Nam Khan/ Nam Can, Cau Treo/ Nam Phao, Lao Bao/ Dansavanh, and Ngoc Hoi/ Bo Y. 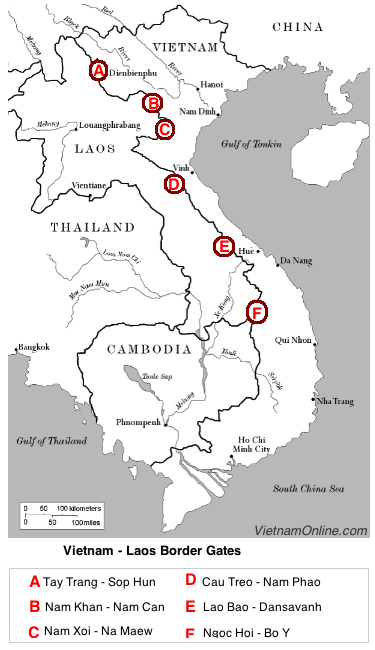 The majority of these borders are in the North and Central region of Vietnam ( see map below). * Highway No.279 from Dien Bien Phu City, crossing Tay Trang International Checkpoint. * Highway No.8 from Vinh City of Nghe An, crossing Cau Treo International Checkpoint. * Highway No.9A from Dong Ha, crossing Lao Bao International Checkpoint. With simpler procedure to travel across border between Vietnam and Laos, having a short tour on land from Vietnam to Laos and vice versa have become more and more popular, and preferred by not only domestic but also international travelers. For Vietnamese travellers, visa is not required to cross Laos’s border but for international tourists, they can obtain visa on arrival at Immigration checkpoint on the border with requirements of a legal passport, one visa-size photo (3×4) and USD 20 for visa stamp. Tourists travel on tour agents’ buses can have the procedure handled by the bus providers with an extra payment of USD25. If you cross the border from Laos to Vietnam, you need a visa in advance, since Vietnam visa-on-arrival is applicable to air travel only. Travellers can choose to hire or use their own vehicle to take a border crossing trip from Vietnam to Laos; however, getting on a bus seems to be more favored because of its convenience in procedure. There are many reputable tourism agencies are currently providing daily border crossing trips such as Trekking Company, Camel or No.14 Bus Company. These buses depart Hanoi at 6.30-7.30pm, travel through night and arrive in Laos in the next day’s afternoon. Both seat and berth buses are available to serve travelers with ticket fare from VND 250,000 (USD 12) to VND 500,000(USD 22), but also varied by seasons and bus providers. In Hanoi, tourists can purchase bus tickets to Laos at one of these addresses: 3A Nguyen Gia Thieu, 35B Nguyen Huy Tuong and Nuoc Ngam Bus Station (Giai Phong Street).